We did it! We survived this year’s birthday party for my 5 year old. 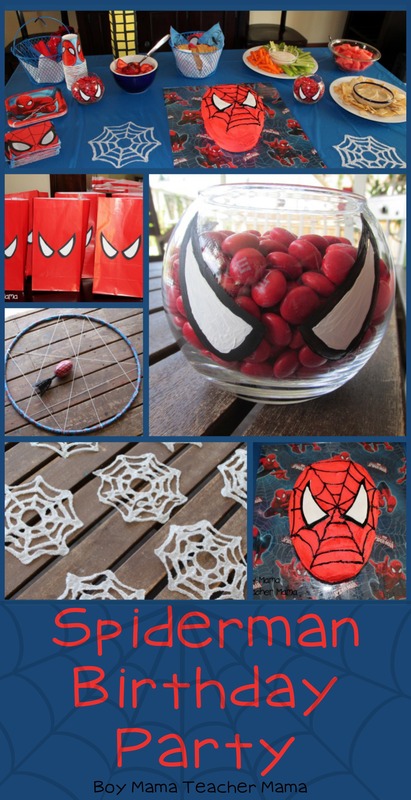 He wavered for months about the theme, but in the end Spiderman won and we had a wonderful Spiderman birthday party. Our party was small. My son only invited 4 friends and his brother was able to invite a friend as well. This number worked quite well because everyone had many chances to participate in the games. I, also, was pretty much planning, preparing and leading the party myself. So thankful that a dear friend stuck around to help!! 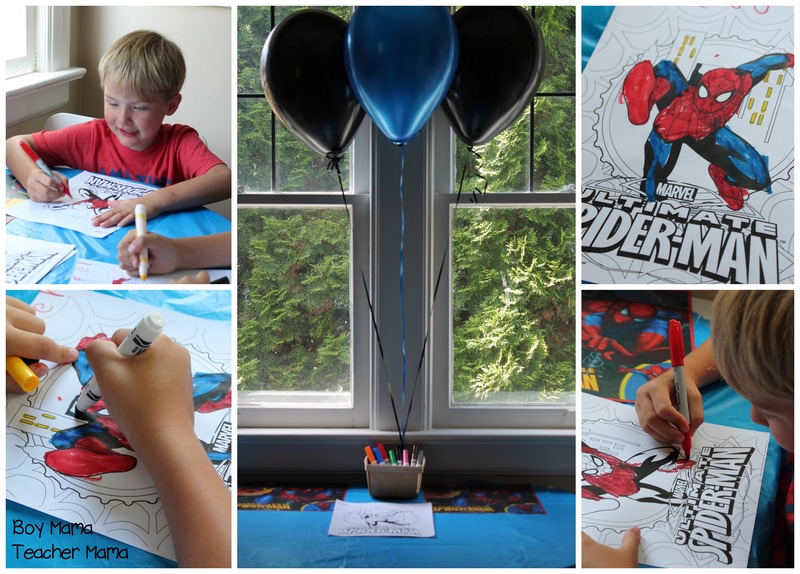 There are heaps of great Spiderman birthday party invitations available at local party stores and on the web. 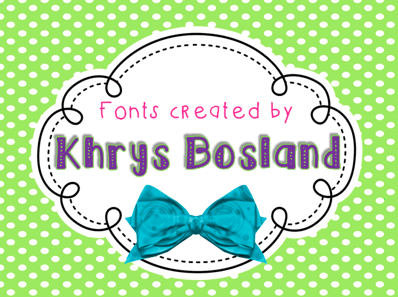 I chose to create the invitation myself simply because it is something I love to do! 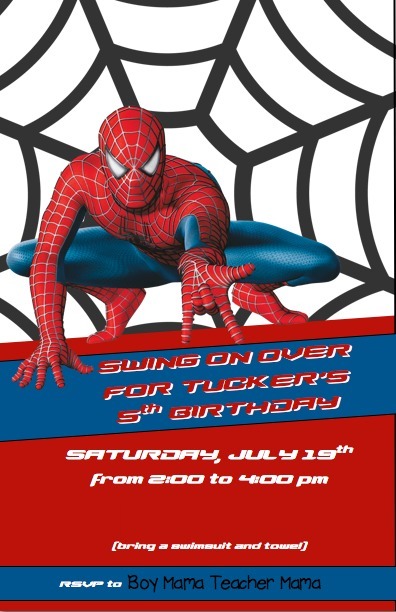 Using a free Spiderman font I found online and the fantastic Spiderman clip art from AAN Art Studio, here is our invitation. This is by far my favorite creation for the party. 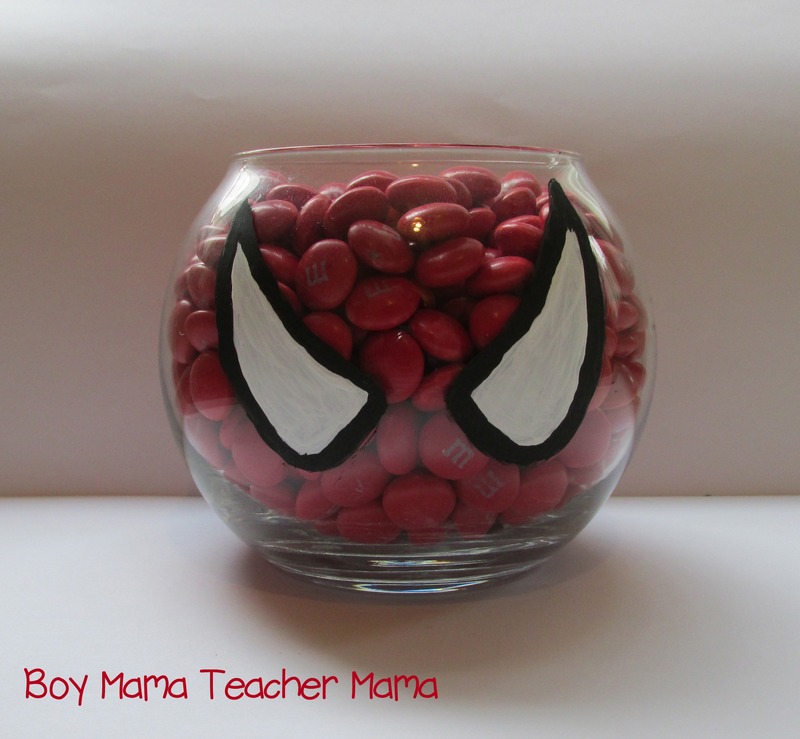 I made these Spiderman face candy dishes from a template, black and white acrylic paints and a candy dish from the Dollar Store. I printed a Spiderman mask from the internet, cut out the eyes and taped them on the inside of the dish. I then used the acrylic paints to “trace” the eyes. 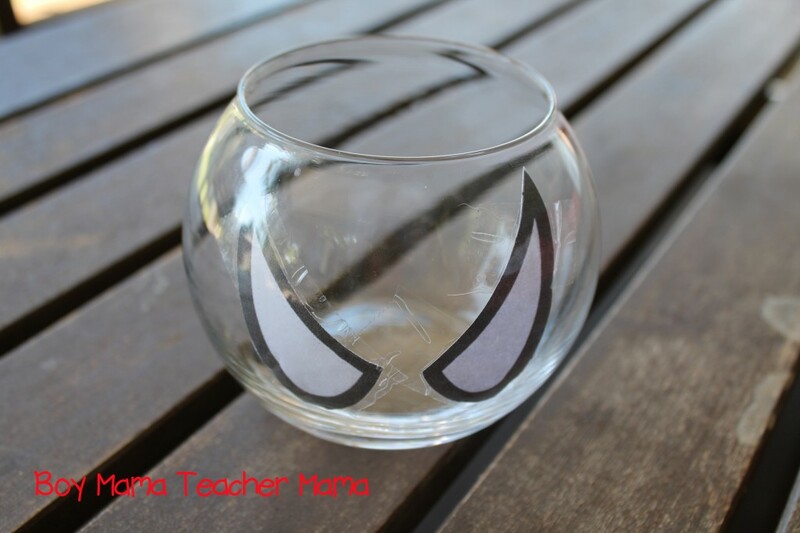 Once I was done, I peeled away the tape/templates from the inside of the dish and was left with great Spidey eyes! These goody bags were pretty easy to make. 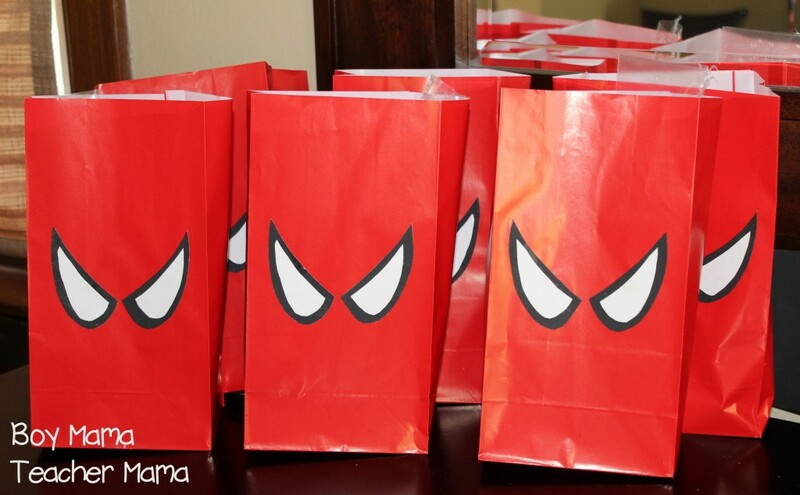 For directions, see our post, Spiderman Goodie Bags. We filled the bags with a Spiderman pencil, a Spiderman journal, a Spiderman flier, Spidey bubbles and some stickers. No candy in these bags! Most of the items we found at our local Dollar Tree or party store. This was a fun creation. I had recently purchased a picture frame, but didn’t need the glass. 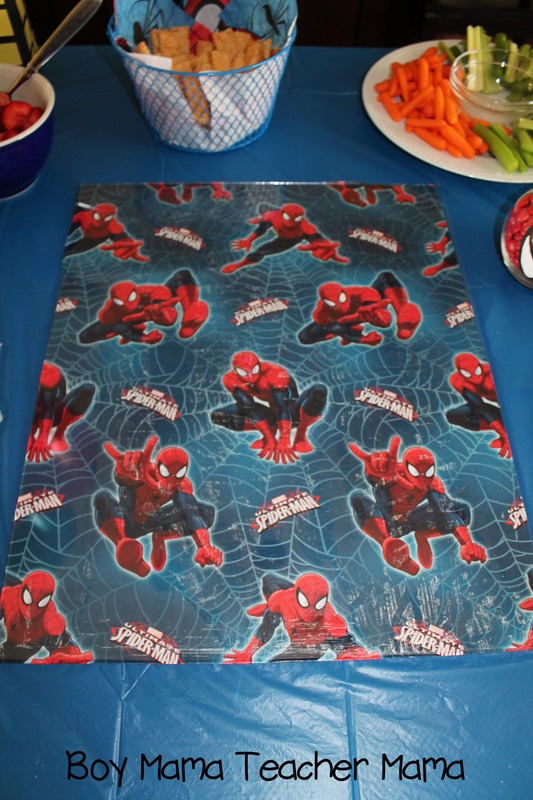 So I took a sheet of Spiderman wrapping paper, cut it to the same size as the glass and put it on the food table as a platter for the cake. This will come in handy year after year as all I have to do is change the wrapping paper beneath the glass to fit the theme of the party! We chose to use the word “baddie” instead of bad guy or villian to honor our time in Australia. This game is basically the same as Pin the Tail on the Donkey only, you pin a spider web on the baddie from the Spiderman comics. To create the webs, I printed our a spiderweb from the internet to the size I wanted. I then taped a piece of parchment paper on top of the web using painter’s tape. My sons and their friend then covered each web with Elmer’s Glue. 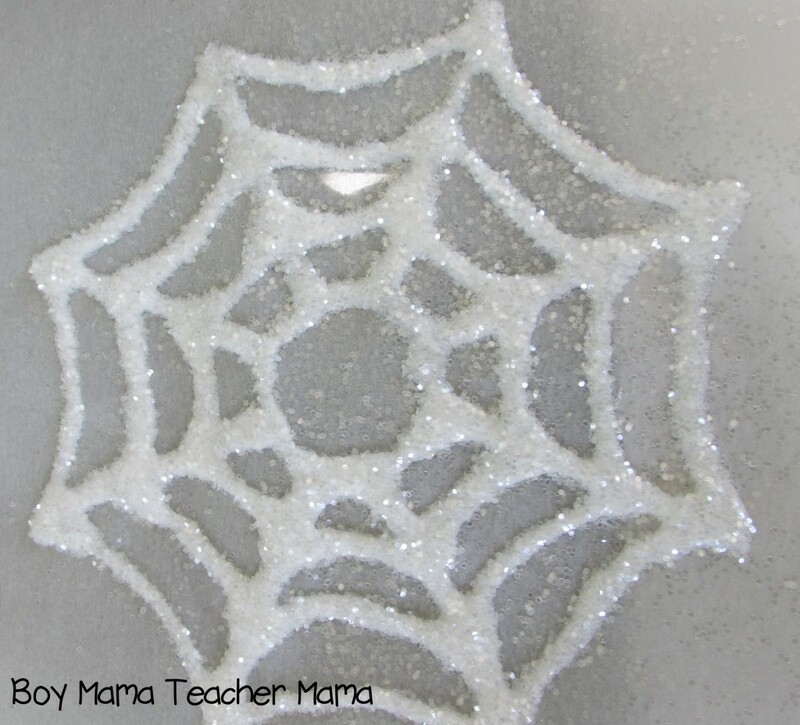 They then sprinkled white glitter from CraftProjectIdeas.com on the glue, shook off the excess and set them aside to dry. 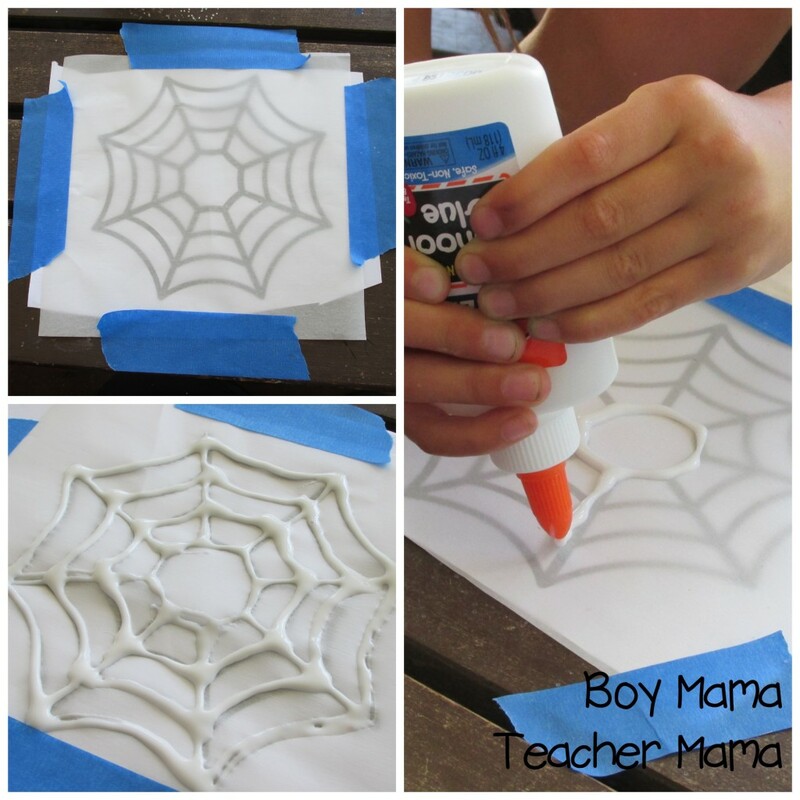 If you plan to do this, plan to make the webs at least 2 days ahead as they tend to take a few days to dry. 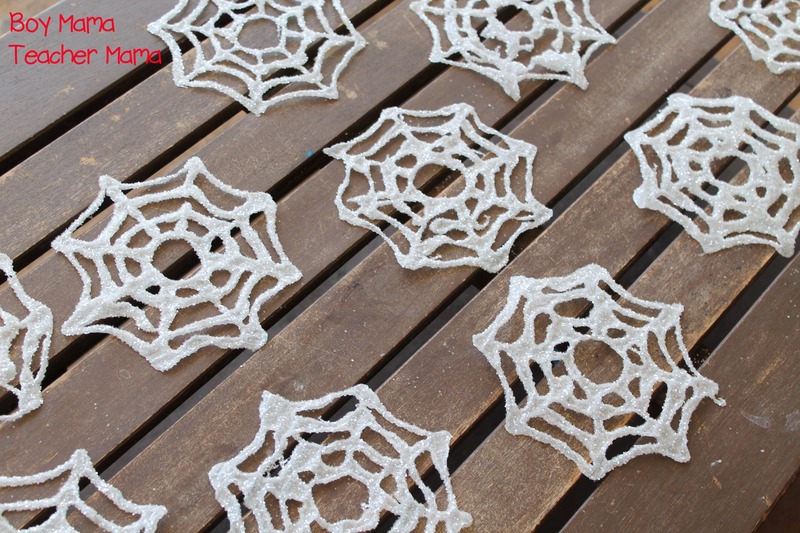 Once the webs were dry, we simply peeled them off of the parchment paper and they were ready to go. 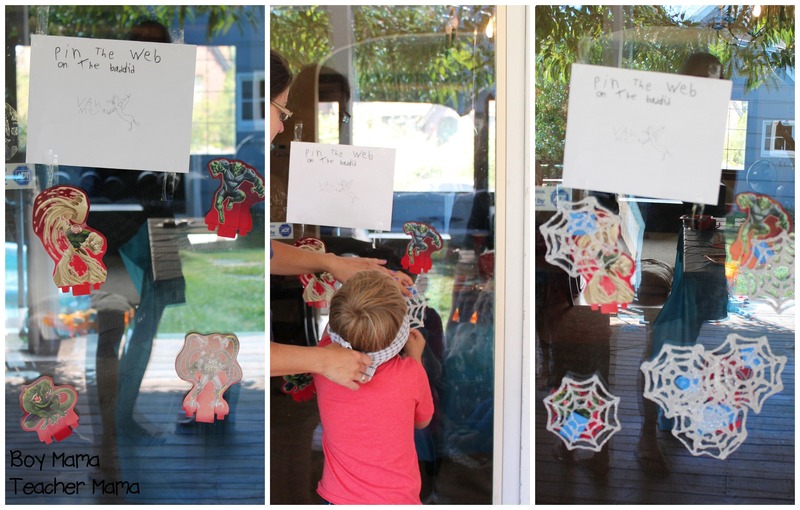 On the day of the party, I hung several pictures of the bad guys from the Spiderman comics on our door. My son and his friend created a sign for the game which we taped on the door as well. When it was time to play, I blindfolded the player, spun him around once and he had to put his web on one of the bad guys. The kids loved this! 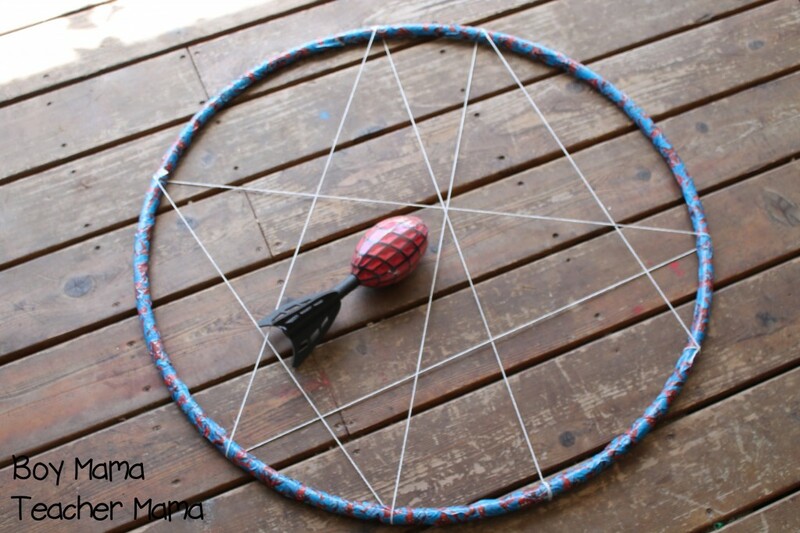 For this game, I bought a cheap hoolahoop and covered it with some Spiderman duct tape I found at the Office Supply store. I then created a web with some string I had in our craft box. I was sure that the openings between the strings were big enough for the little ones to play the game and be successful. I found this spider ball at Joanne’s for the game. To play the game, have one person hold the hoolahoop web up and the players take turns trying to get the spider ball through the web. Another big hit with the guests! 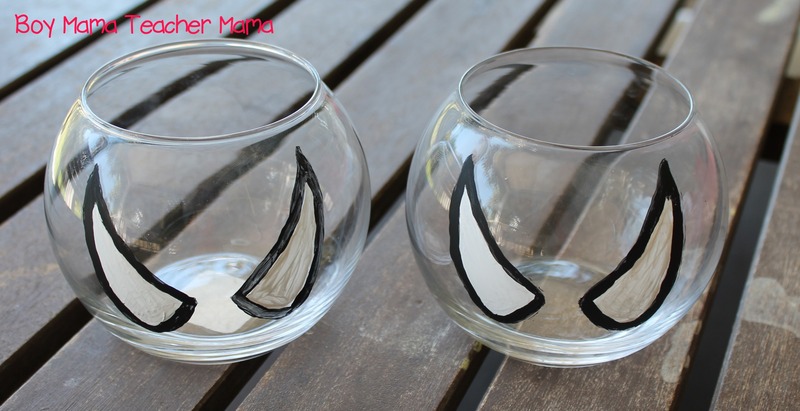 I always like to have one quiet activity at our parties for those kids who need a bit of space or quiet. I printed a bunch of Spiderman coloring pages and put them on our kitchen table with some markers for those that were interested. This was my challenge. I actually “erased” the face on this Spiderman cake 3 times before being okay with how it looked! Yes, I am a little bit of a perfectionist. 🙂 If you would like directions for creating this cake, please see our post, A Trashy Celebration. 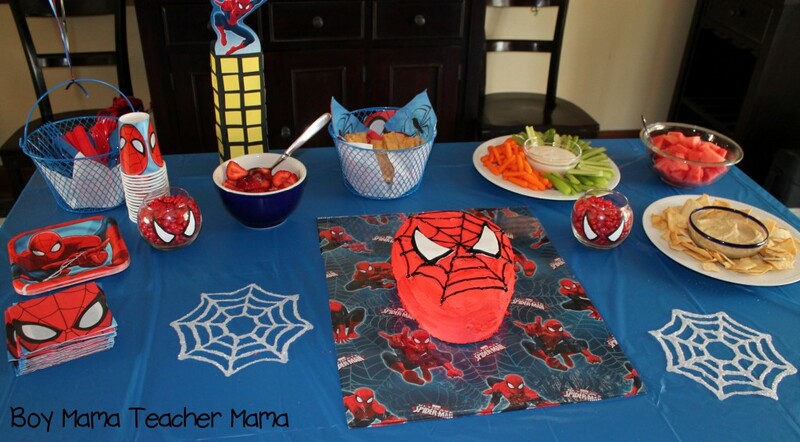 Follow the same steps for creating the cake, only use a template for Spiderman’s face instead. 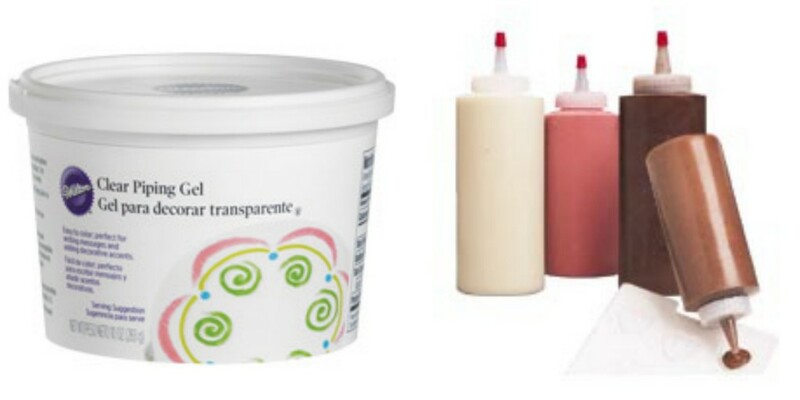 A few notes: 1) To get a good red, you will need two containers of red gel. It is very hard to get a good red. Also note that the red will deepen with time so the longer the icing sits, the darker it will become. 2) For the eyes, I purchased some white fondant. I printed out some Spiderman eyes and cut two pieces of fondant the size of the whole eye and a second set the size of only the white part of the eyes. I did not want to color the fondant by mixing in the black food gel, so instead I “painted” the larger set of eyes with black gel food coloring and allowed it to dry. I then put the smaller. white fondant eyes on top of the black. 3) For the web on Spidey’s face, I purchased some of Wilton’s Clear Piping Gel and added some black food coloring gel to it. I filled a small decorating squeeze bottle with the gel and used that for adding the webbing. 4) Before adding the black gel icing, I used a small knife to “sketch”the webs on the face. This helped guide me when adding the icing. 5) Oh, for the filler icing between the two cake slices, I used royal blue icing made from royal blue gel food coloring. Here is what our table looked like when it was done! 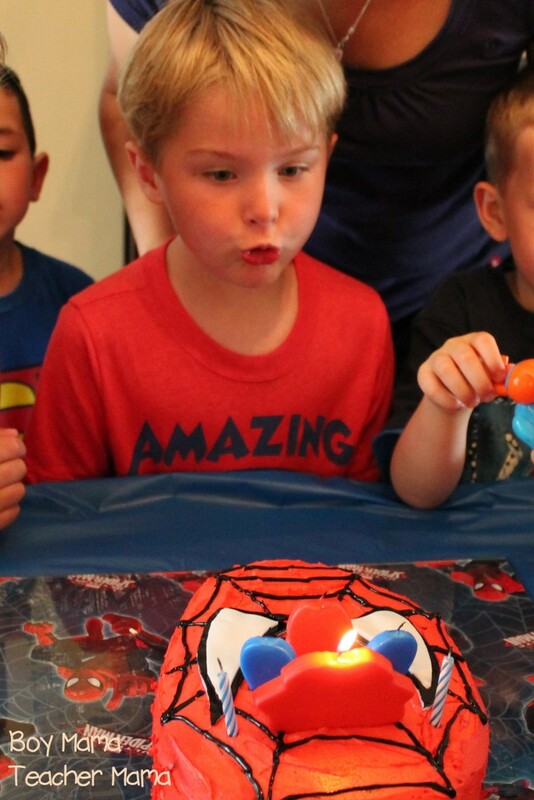 And, here is the birthday boy blowing out his candles. 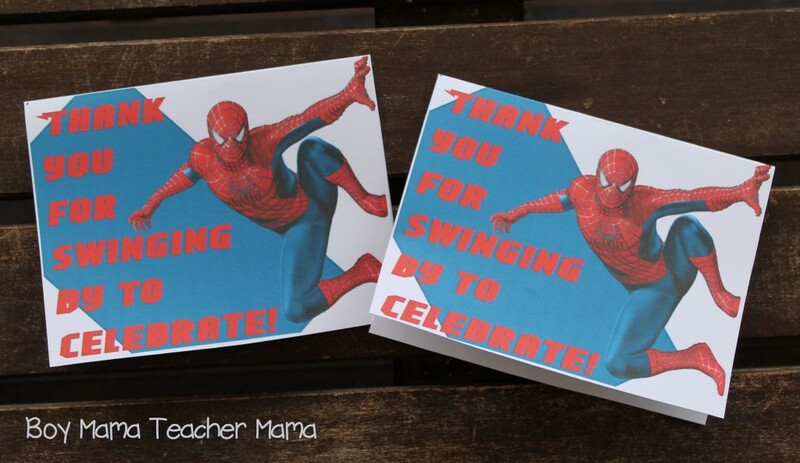 Of course you cannot have a party without thank you notes! Here are the notes I created for our thank you notes. Oh, and here is one more silly addition to the celebration. I painted my toenails for the party. 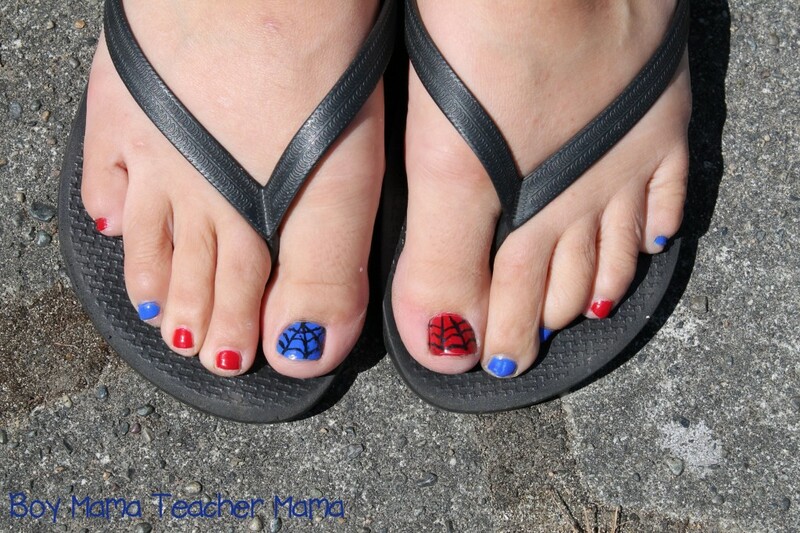 I used red and blue nail polish and then added webs with a black nail polish pen. 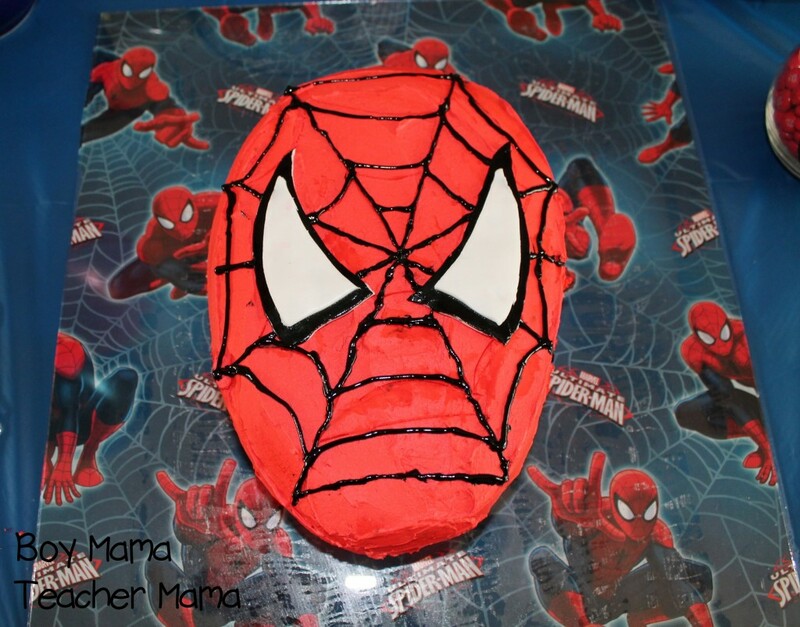 hello I would love to make the Spider-Man cake for my son’s birthday but I followed the link and I couldn’t find directions for it. Could you please send me the link. Hello! The link I sent you to was for the directions for making any cake. The only difference between the two cakes is the shape and colors. Follow the directions for the garbage truck cake using the spidey cake shape. I simply googled an image, made it the size I wanted and traced it onto the cake! I hope this helps! If not, email me at [email protected] and I can try to help further.